This article is about the race course from Mario Kart: Double Dash!! and retro course in Mario Kart Wii. For the race course from Mario Kart Arcade GP 2, see Waluigi Stadium (arcade). 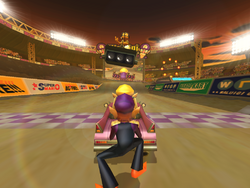 Waluigi Stadium is the last race track of the Flower Cup in Mario Kart: Double Dash!!. It bears a striking resemblance to the dirt bike course, Wario Stadium from Mario Kart 64. Obstacles include Fireballs, Fire Bars, and giant wooden Piranha Plants. The audience section includes classic Nintendo characters like Toads, Boos, Shy Guys, Koopa Troopas, Snifits, Birdos, and Donkey Kong Jr. The music played during racing is the same as the music that plays during racing on Wario Colosseum. The audience of the course (solely) oversees the player's or players' progress, shouting/moaning if the player is attacked by an item, or spins out from the fireballs present on the course. This is the only course in Mario Kart: Double Dash to have a large audience made of 2-dimensional animated characters as opposed to models, although later games would have this in many courses. A time trial run at the stadium as seen in Mario Kart: Double Dash!! The track starts out just before a bump and a turn to the right. On top of the bump yields Item Boxes for the player to use. On the right turn after the bump is an overhang of a later part of the track, plus minor bumps that do not serve any purpose for the player. After the overhang is a turn to the right, which has a bump and Dash Panels on it. Panels give a speed boost to the vehicle to cross a fire ring with an item box in the center, if driven through correctly, avoiding the flames of the fire ring. After the fire ring is a U-turn to the right which leads to more boost panels and another fire ring with an item box in the center. The player can see the lower sections of the track, previously raced on when going over this ramp. Passing after the second fire ring, racers take a loose curve to the left around a mud pond that heavily slows the player down, regardless of acceleration (Mario Kart Wii's case would be Off-road) of the vehicle. Item boxes are found on the curve of the track. After the large oil slick is a turn to the left, that leads to a straight and wide path. The path has card-board cut-outs of Piranha Plants, leaping out of pipes slowly to slow down the player by bumping into them. Fire Bars lie in between each Piranha Plant, rotating their arms to burn a driver and to spin out of control. When a Chain Chomp or racers under the effect of a Super Star hits these Fire Bars, for some reason, the Fire Bars will speed up for a brief amount of time. Item boxes are just found in the sides of the area. After this part of the course is a turn that leads left and into another relatively straight section of the track. There are a pair of hills that racers can employ to do a trick in Mario Kart Wii. The straight road bends in a U-turn to the right, with another set of item boxes. The road twists at this part, and racers will slow down if they get caught running over the muddy zone to the left of the path if they don't have a speed boost item. The twisty path leads to a great jump over the hilly section, which leads to the last item box and a fire ring. Dash panels found over the ramp provide racers to cross the gap and reach the other side of the track that leads directly to the finish line; however, if racers fall into the gap, they will fall to a lower part of the track and Lakitu has to rescue them. 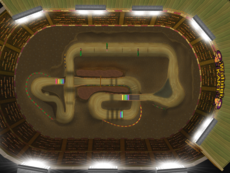 Waluigi Stadium returns in Mario Kart Wii as the last course of the Banana Cup with some changes, such as the addition of halfpipe ramps at the sides of the course for racers to perform tricks. The positions of the Piranha Plant pipes have been reversed (left to right, right to left). The tiny hill near the end of the course has also been removed. Also the facial chevron signs that rock back and forth were changed from purple chevrons with a black background to light green chevrons with a translucent background. The audience also appears to be bigger than the original version. Unlike in the original, the crowd does not moan when the player gets hit by an item or hazard. However, the audience does cheer when the player does a trick off a ramp. The members of the audience have changed, and no longer include Snifits nor Donkey Kong Jr. In Mario Kart Wii, a tournament took place on this track. Players had to pass through a total of twenty-five gates as quickly as possible. It was the first tournament of April 2009, and it was later repeated as the first tournament of April 2011, the first tournament of July 2012, and the second tournament of September 2013. "The plentiful bumps and hills - plus new half-pipe boost pads - make this the best track for tricks." "A roaring crowd shows their appreciation as you take the stadium by storm - jumping through fiery hoops and tearing up the dirt track on your way to the finish line." Waluigi Stadium in a pre-release photo of Double Dash!! This page was last edited on December 21, 2018, at 11:12.